Will the penultimate episode here be as good as the penultimate episodes in the TV series? 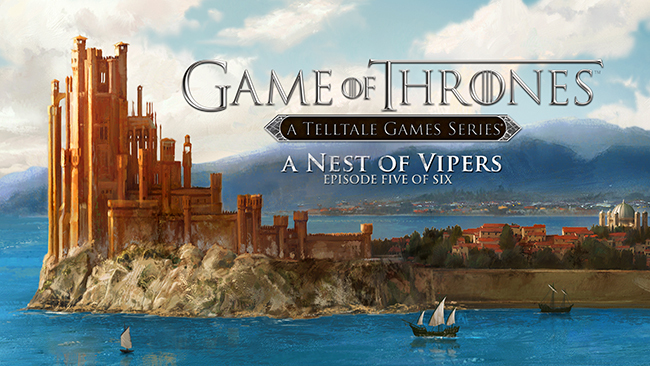 The fifth episode in Telltale Games’ Game of Thrones series of adventure games will be called ‘A Nest of Vipers,’ and it will be releasing next week on July 21. This fifth episode will be the penultimate episode of this series, which is planned to go on for multiple seasons, with six episodes per season. You can get the game on July 21 on PC, as well as on PS3 and PS4 via PSN; Xbox 360 and Xbox One get it the next day, on July 22, via Xbox Live. Finally, iOS and Android will get it on July 23.